The Mitsubishi iMiev has not been overwhelmingly well received by the automotive press. Critics call the little car "a golf cart on steroids". 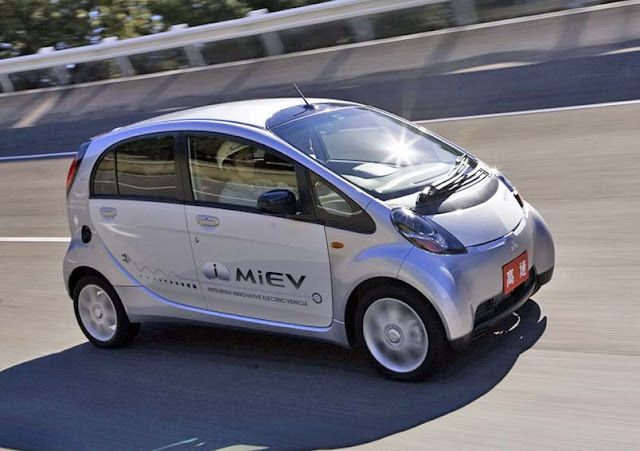 The iMiev does look similar to the GEM car neighborhood electric vehicle. Although the iMiev looks like a golf cart this little car meets my definition of an automobile. It is freeway capable, crash tested, includes ABS , A/C, power widows CD player and other things golf carts will never have. It is also the cheapest current production EV available, $8,000 cheaper than the Nissan Leaf. So where did Mitsubishi save the $8,000 price differential between the Mitsubishi iMiev and Nissan Leaf . The money seems to have come out of the car's interior. The seats, dash and door panels are decidedly low end. Cheapness abounds in the gear shift lever and radio screen as well. They had to save a little on the wheel covers and door handles too. 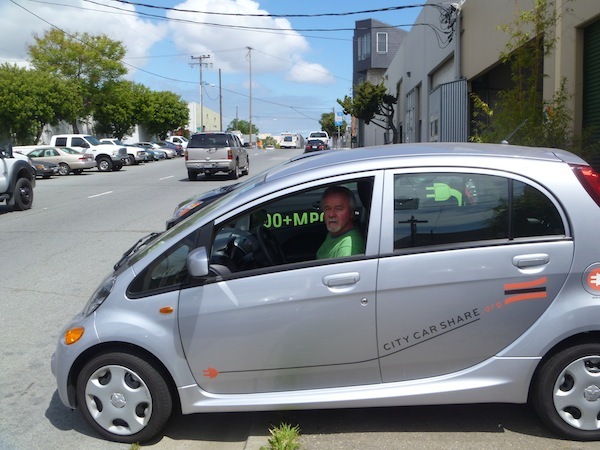 The surprising thing about the cheap little iMiev is that it really works pretty well in an urban environment. My drive through San Francisco was surprisingly comfortable. Winding along the Embarcadero I probably topped out at 40 mph due to normal city traffic. In Urban driving you really do not need much power or road handling capabilities you just need to creep along in your lane winding your way through the dense urban maze. In fact big comfy cruisers can be challenged by the maze that is downtown San Francisco. Being small can be an advantage. In terms of comfort factors I felt that the A/C worked well and the car was very quiet, not bad for a golf cart. Again the big cruiser would loose downtown when you think about operating costs. I remember my LS 400 would get 11mpg in Downtown traffic. All said this car needs to be used in it's native environment - dense urban city life. If you live in the suburbs and do a high speed freeway commute the Leaf is a far better match among the electric car choices available. 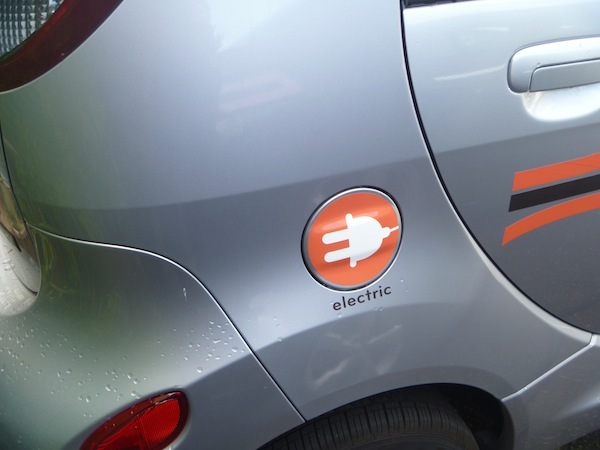 If you use the iMiev for the intended purpose of local commuting it is quite functional. The electric motor is connected to a single speed transmission as is the case with all current production EVs. 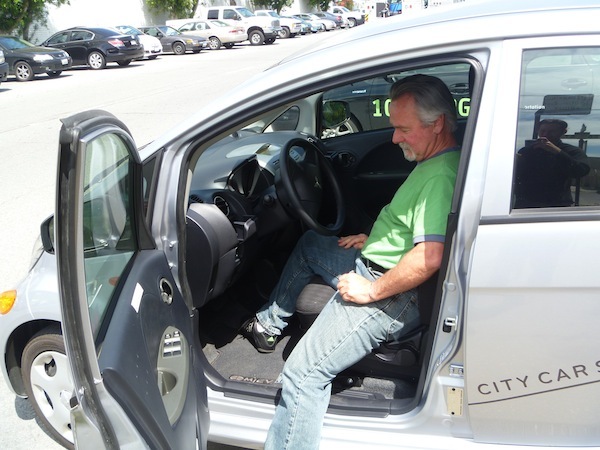 The electric motor has enough power to scoot around town with very little of the electric whine associated with EVs. It is so quite it makes one wonder why are the other EVs making that whine noise. Sounds like the worst specs of any EV on the market, well it is $8000 cheaper than the next cheapest alternative so there it is. One interesting advantage of the small capacity pack - it will fully charge from a 110v outlet in only 12 hours. If you live in an urban environment and want to go electric, the $21,000 iMiev is a viable option. The main downside is the somewhat homely appearance of the car. Where are the interesting fun little efficient commuter cars like the British and Italian cars of the early 70's. Urbanites don't mind small cars but they have to be stylish to inspire the desire to own one. The $25,000 Mini cooper is still selling like hot cakes here in San Francisco.